You are currently browsing the tag archive for the ‘Foredom’ tag. Blog-o-Sphere Think Tank: What’s your Favorite Tool? Today’s topic for our Blog-o-Sphere Think Tank is “What is your Favorite Tool?” The subject was not limited to the tools we use in our respective studios. There were many that came to my mind. To qualify as one of my favorite tools, the tool must be practical and functional. My dad taught me the importance of good tools. So my narrowed down list ranges from my Chi flat iron (in purple of course! ), to my NC Black Hammers, to the pooper scooper (yes, I know eeeiiiiwwww, but when you have doggies, it’s a necessity!!! 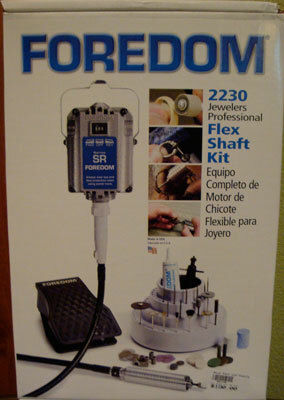 ), to my Husqvarna Viking sewing machine….yet, I kept coming back to my trusty Foredom Flex Shaft! I truly love tools that make my life easier and this is definitely one of those. It goes to the head of the class and I have found using it invaluable in my studio. 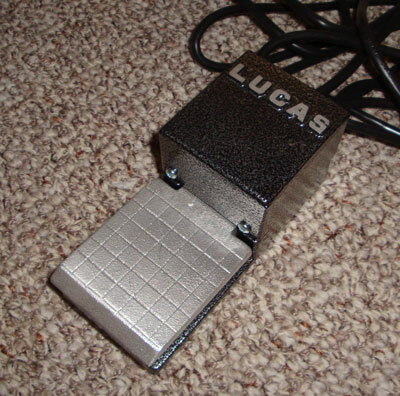 This little beauty is a foot controller manufactured by Lucas Dental Equipment. It is attached to my Foredom Flex Shaft and works like a dream. It was a Christmas gift from my dear sister Lexi this past year. I was delighted; thanks again Lex! I had this on my tool wish list for well over a year. The first time I saw one of these was in Lexi’s studio. She told me about the benefits of having a variable speed control pedal that would allow you to start out slower than any other foot controller. 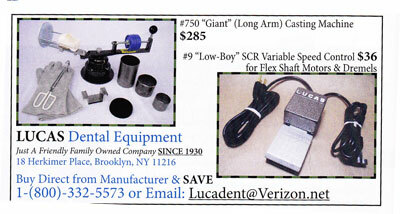 It definitely gives you great control as you work with your flex shaft or dremel. The foot controllers that come with Flex Shafts don’t let you start at the very slow revolutions per minute (rpm) like this one does. There are times when you really need a delicate touch to start working on something you are fabricating. This pedal fits the bill! If you Google this, you find lots of positive feedback about the quality of the device. And I am one who will chime in that this is a great addition to your metalsmithing studio. This is the ad that Lucas runs and I thought I would share for those of you may be interested in adding this gem to your studio. I think you’ll be very happy you did. This was the stone that almost got away. In April, when Gary B Wilson and his family were in Denver for Rocky Mountain Bead Bazaar, I spotted this particular stone. In fact I wrote about it in my April 25th post. It is an Imperial Jasper and I was quite enamored with it. If you’d like to read about how it entered my collection of stones, check that April 25th post. I knew I wanted to keep the setting clean and simple for this stone; I just wanted to showcase its beauty. I did extend some of the stone’s markings into the surrounding metal. The setting is sterling silver, that is lightly oxidized. It reminds me of a calm prairie with a few wisps of grass in the foreground. So I felt the name Serene was appropriate. 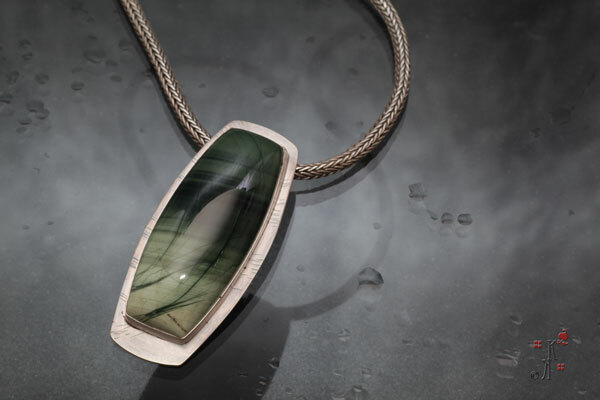 This will be one of my pieces available at the Jewelry at the Gardens in Denver on the weekend of October 16 & 17. I’m still working on pieces for that show and will have more to post in the upcoming days and weeks after Dan photographs them. Earrings from my Soul Searching series, these represent my new growth as a metalsmith. Lots of different techniques here. My first venture into Keum Boo. Keum Boo is a seriously cool technique that involves bonding very thin, 24 kt gold, to the surface of your metal. The link I’ve given is to Wikipedia’s explanation and I think they’ve provided a good description of Keum Boo. I kept the design pretty simple again. I’m using Sterling Silver for the background and the ear wires. The texture I created on the sterling was done with the use of my Pepe rolling mill and a piece of fabric. I am so into creating textures on metal. Looking at mesh for screen, lamp shades, artificial flowers, well…I look for pieces I can use to texture metal just about anywhere! Once I had the texture in place, then I filed the edges so they would be smooth. I added a line to represent the branch for the leaves. The lines were created with a very tiny diamond coated bit and my new Foredom. The sterling needs to be annealed several times to bring the pure silver to the surface. This provides the adhesion layer necessary for the Keum Boo to bond completely. Time for the placement of the leaves, which are the Keum Boo part of these. I traced the leaf design on the paper to use as a guide for cutting them. Using my Joyce Chen Scissors, I was able to cut out these very small leaves. If you have need for an ultra sharp pair of scissors, get some Joyce Chens. They will cut chicken bones and you have to be VERY careful when you use them as they don’t distinguish between bone, fingers, or metal. I can’t speak from personal experience on the injury front, but I have been instructed to be careful with them (thanks Lexi 🙂 ) and I want to pass that information on to anyone who hasn’t used them. Now we’re ready to bond the leaves to the surface. Truly an interesting process. Lexi is demonstrating how this is done and I’m watching, completely fascinated. Now it’s my turn. Wow. She has one of those glass cook tops and that was our surface for heating the metal and then using a burnisher to gently rub the Keum Boo as it’s bonding to the surface of the silver. Who would have thought! Of course, as with anything, there is more than one way to do this. I just never expected to put metal on a stove top and that would bond two layers of metal together! Once the bonding is complete, we decided to add a patina to really have the gold stand out. Well, after all, it is gold and no matter how small, one should be able to see it. Another technique Lexi showed me was how to create those cute little balls on the end of the ear wires. I did have fun doing this on my own and will be incorporating this into more of my work. I added patina to the ear wires (also sterling silver) so they would match the earrings. Ever since my Creative Block break through, I have been literally consumed with trying new things and variations on techniques I already know. Metalwork is truly fascinating to me. These earrings do symbolize my New Growth as a metalwork artist. I am a woman who appreciates the value of tools. I’m fairly certain that my father helped to instill that appreciation. And I feel like Tim the Tool Man Taylor…it’s Tool Time for Kathleen. Here’s my new baby, the SR Series from Foredom. This one even has a reversible speed! Whooo Whooo….or maybe I should try that famous grunt from the TV show? Any way you look at it, I am the proud owner of a beautiful new power tool that will give me years of service. 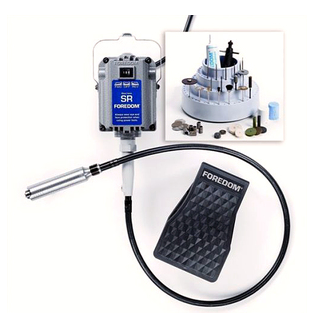 The Foredom is a Flex Shaft Power Tool that has a variety of attachments. This one is on special through the month of October from our local supplier, Naja Tools. It has a nice tool kit of attachments included too. Bonus! Lexi just happened to be in their shop and saw this gem, called me, and the next thing you know, this bad boy is in my arsenal of prized tools! 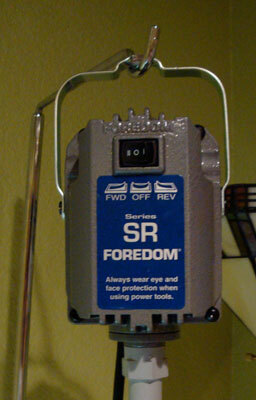 I had a dremel and that does the job, but when you need more power (insert grunt here), well, the Foredom delivers. I will use this for polishing, buffing, bringing pieces up to a high polish, drilling, and I’m sure to discover more uses too. I’m terribly excited about this new addition. Continuing to aspire to be more as an artist and a person!